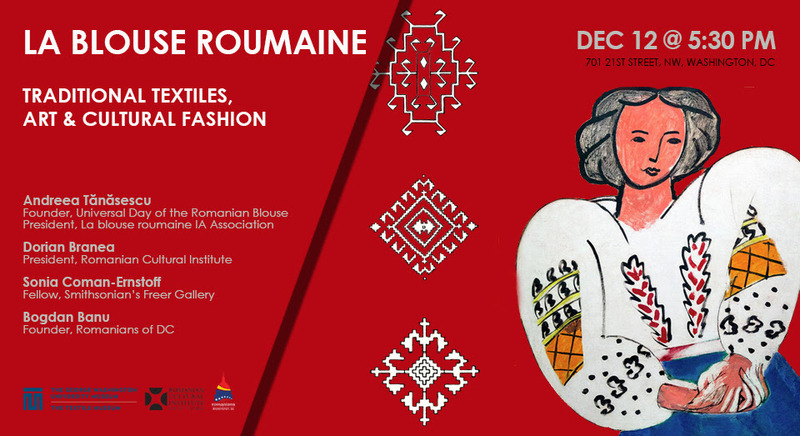 From Romanians of DC: You are cordially invited on Wednesday, December 12 at 5:30 pm at the Textile Museum (701 21st Street, NW, Washington, DC) to attend the official launch of the brand new La Blouse Romaine Magazine presented by Andreea Tănăsescu, the founder of the Universal Day of the Romanian Blouse social movement and President of IA Association. The launch will be followed by a moderated discussion on the importance of the folk costume as an identity marker and a source of identity and of inspiration with: Dorian Branea, President of the Romanian Cultural Institute in the U.S.; Sonia Coman-Ernstoff¸ Fellow at Smithsonian’s Freer Gallery, and Bogdan Banu, Founder of Romanians of DC. The event will also feature a collection of traditional Romanian folk costumes. Cultural diplomacy takes many shapes and forms. The forms and ornaments found on the Romanian folk blouses, are just the latest and probably most unusual manifestation of what cultural diplomacy can be. Unbeknown to most, the Romanian blouse is truly an universal cultural icon. Worn by celebrities, part of cultural revolutions such as the hippie movement in the 60s, loved by famous fashion designers world-wide, and an inspiration for famous artists or movie characters, the Romanian blouses trace their origins back to the ancient civilizations found along the Danube river thousands of years ago. They preserve a part of the language of signs and symbols specific to the mythical thinking of those times. In 2013 a truly global social and cultural movement was born in Romania centered on the Romanian Blouse. It was a movement born out of a desire to preserve and pass on to a new generation this symbol so central to the Romanian identity. Romanians around the world were asked to post a photo or a selfie wearing their blouses on social media as a way to reach and educate a wider public. In just six short years the movement has grown exponentially to some 200,000 member, celebrated annually on six continents, over 60 countries and some 300 cities. The Universal Day of the Romanian Blouse is now celebrated like a national holiday in both Romania and the Republic of Moldova and has been recognized by governments in Washington, DC, Canada and elsewhere. Andreea Tănăsescu is the creator and founder of La blouse roumaine movement that has contributed decisively to the rebirth and renewed interest in traditional Romanian culture on a global scale. 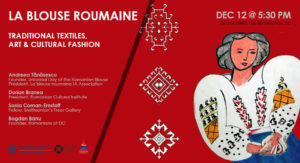 She is the creator of the Universal Romanian Blouse Day, Brâncuși Week and Cultural Fashion Day and the President of La blouse roumaine IA Association, a non-governmental organization that promotes the preservation of the Romanian textile heritage, cultural and sustainable fashion. In 2017 Andreea started Give Credit that militates for culturally responsible design and now she is currently working on the development La blouse roumaine magazine. She studied Law and Public Relations and she has been involved in the fashion, media and movie industry for more than 20 years as a talent agent and casting director for major international film productions as The Fall by Tarsem Singh, Callas Forever by Franco Zeffirelli, Amen by Costa Gavras, Modigliani by Mick Davis. Dorian Branea, cultural diplomat, cultural entrepreneur, author and translator, is currently the director of Romanian Cultural Institute in New York. Previously he was a Fellow at the Central European University (2003-2004), Founding Director of the Romanian Cultural Institute in Warsaw (2006-2010) and Director of the Romanian Cultural Institute in London (2010-2018). He also served between 2012 and 2014 as President of the London association of cultural institutes from the EU countries (EUNIC). He studied English at the Western University of Timișoara, followed by graduate work in International Relations at Georgetown University’s School of Foreign Service and Negotiation at Oxford University’s Said Business School. Ph.D. in English and American Studies. He is the author of The United States of Romanians published in 2016 at Humanitas. Sonia Coman-Ernstoff is a Romanian-born art historian and poet. She received a B.A. from Harvard and a Ph.D. in Art History from Columbia, where she taught an undergraduate seminar on the soft power of ceramic arts across world cultures. As the Anne van Biema Fellow at the Smithsonian’s Freer Gallery, Dr. Coman is currently preparing a book manuscript on the formation and legacy of Charles Lang Freer’s collection of Japanese ceramics. Her poetry has been published and awarded internationally. Her latest book, Passages, was shortlisted for The Haiku Foundation’s Touchstone Distinguished Book Award.